I wasn't sure if Happy Birthday was an ideal fit for my blog as director and editor Russell Duncan stated it wasn't horror. However I thought I would check it out anyway, and while it is a little rough around the edges I did enjoy the idea behind it, and it does share some elements with everyone's favourite genre. As an aside this is the last film I have currently been sent for review so it is nice to clear that list for the moment! 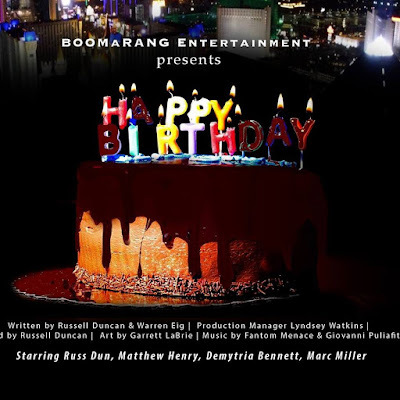 Happy Birthday is nearly 22 minutes long and is a drama with some thriller elements to it, as well as some comedic elements, though the majority I would class as drama. The two main leads are likeable enough in their own way, Preast is the more wild of the two, while soldier Bond who suffers PTSD is the more calm and collected one. Bond frequently has flashbacks that are displayed as quickly edited shots of a bloodied face up close. I liked the way these flashbacks were inserted, they gave foreshadowing that not everything is really as it seems with the innocent getaway. The most horror based thing to be shown in Happy Birthday is probably Bond's ring tone which is the Exorcist theme, but towards the later half things step up, though never in a way that gives any sense of peril. Bad things happen but the characters never really act as if they are that worried, this can be excused in terms of where the plot goes. Personally the reveal at the end was pretty cool, I liked just how close the bond of friendship was for these two. The biggest problem production wise is with audio being a issue throughout. It is never so bad that you can't hear what people are saying but at times background noise pops in whenever anyone speaks taking away some of the immersion. The pacing wasn't bad for this but at times it was hard to tell the passing of time, helpfully we often get what the time is popping up on screen when ever a new scene starts. The execution may be hampered at times but the way this all plays out was satisfying with the potential of this story plain to see. Happy Birthday is available to watch on YouTube, I shall include it down below too if you fancy giving it a watch.